Cassette Gods: CAVITY "No. 1"
Hidden within this homemade, hand painted, fingerprinted exteriors you will find a mysterious maximal industrial gem from Belchertown, MA. Two cuts deep; just enough to give a taste of the metallic frameworks and detuned oscillating leads fit to score an escape from warehouse fiends hungry for skin. 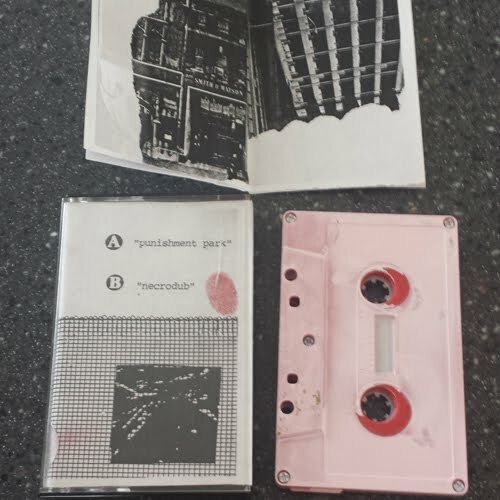 Punishment Park is as thick as magnetic tape will allow, with percussion pressing and diminishing only allowing a few bits of synth and atmosphere to breathe. The second track, Necrodub, is a bit more reserved but deeper. Pulsing bass, washing noise, and tormented leads suggest those fiends caught up to their prey and are recording the death rattle. Following the DIY cues of the packaging and recording, cavity’s general direction is very punk, unapologetic but mysterious.